SenSpa and Cyclexperience within walking distance. 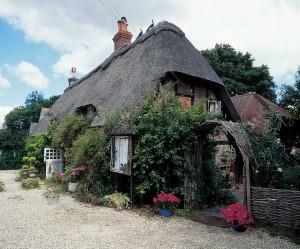 Thatched Cottage Hotel sometimes limits bookings to 2 or more days. Situated in a separate chalet in the garden behind the historic Thatched Cottage, the Garden Suite is a beautifully decorated modern, comfortable suite, with two inter-connecting rooms, which are available to book as separate Garden Double ensuite rooms, or booked together as two rooms, with two bathrooms, a lounge area and a dining area with a kitchenette. Perfect for families or groups travelling together, with the facility for self-catering if you prefer. Garden Suite sometimes limits bookings to 2 or more days. Situated in the garden behind the historic Thatched Cottage, the Garden Twin rooms are beautifully decorated modern, comfortable en-suite rooms, with two single beds. Garden Twin sometimes limits bookings to 2 or more days. Leave the M27 Motorway at Junction 1 and continue to Lyndhurst via (A337), until roundabout after the slip road. On entering Lyndhurst you will reach a set of traffic lights and the road bears left. After 300 yards, take a right signed for Brockenhurst. Stay in the left hand lane and you will soon leave Lyndhurst. After 5-6 miles you will reach Brockenhurst. Continue through Brockenhurst until you reach the train level crossing. Just before the level crossing, you will see a pub called the Snake Catcher (On the left) and short road on the right. Turn into this road and after 100 yards take a rignt turn and the Thatched Cottage is 100 yards on the right. Trains from London Waterloo mostly depart twice an hour and are direct to Brockenhurst. Travelling time is approximately 90 minutes. From the train station, we are only a 5 minute walk. The hotel was very comfortable & clean, the only criticism being that the shower was a little too small. The staff were friendly & helpful & the English breakfast very good & cooked freshly to order. The garden rooms had a patio & the room French windows so as we could sit outside & relax in the evening. Thoroughly recommended.